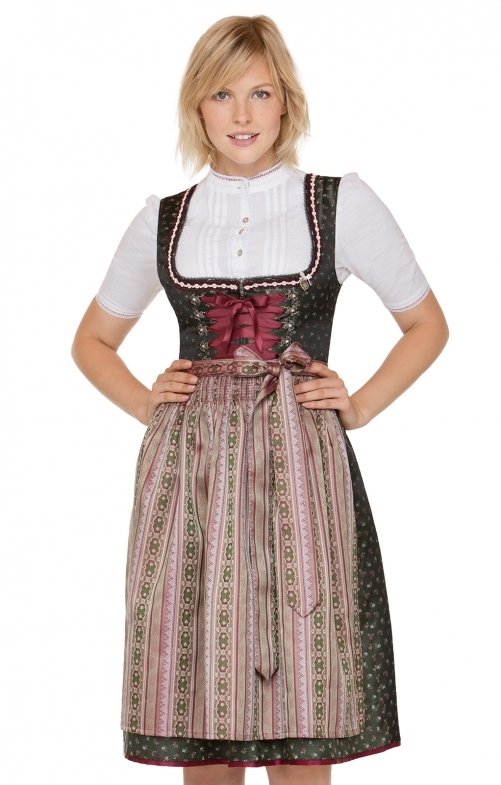 Women's midi dirndl marina by Stockerpoint in fir and berry. The fabric is decorated with a flower motif and enchants the exclusive jacquard dirndl with numerous lovely details. The bodice with classic neckline, the colour-coordinated decorative border and the elegant bodice hook with rhinestones complete the feminine décolleté. The matching satin ribbon tie is skilfully presented. The swinging skirt with a back pocket is tasteful and is perfectly rounded off by the apron of stripes jacquard and a matching apron ribbon.